Alex Manché, Nicholas De Piro and Lucy Paterson. For one night only, art historian Marquis Nicholas De Piro and gifted pianist and heart surgeon Alex Manché will be leading a unique soirée of poetry, singing and music at the Salesian Theatre. Folly, Fantasy and Feeling, which will have one performance only on February 27, will showcase a selection of locally-connected, humorous and sentimental poems, composed by several poets and performed in English. The evening’s entertainment will not only feature hilarious and thought-provoking Malta-related poetry however. This one-of-a-kind performance will also include music, song and even a chorus line, in what promises to be a truly memorable event. Folly, Fantasy and Feeling is the second poetry grand soirée to be presented by the marquis and Manché in aid of the Save Valletta’s Skyline Appeal, following the highly-acclaimed Nostalgia, Notions and Nonsense, also performed by the duo at the Salesian Theatre in April 2018. 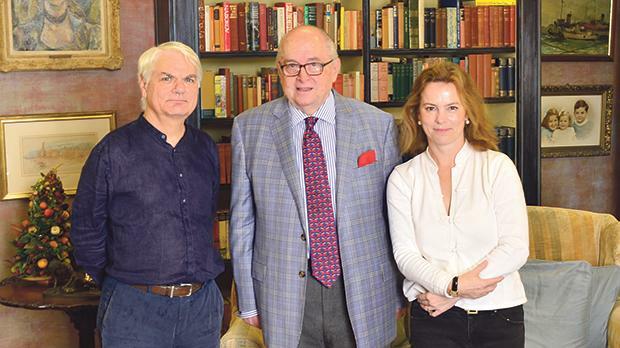 As a lover of art, poetry and Malta’s rich history, Marquis Nicholas de Piro has penned a number of anecdotal books and poems, and has recently opened Casa Rocca Piccola in Valletta, the home he shares with his wife Frances (Ding), to the public. Although co-hosting Folly, Fantasy and Feeling as a pianist, Manché is also a consultant cardiothoracic surgeon at Mater Dei Hospital having set up the cardiothoracic unit in Malta in 1995. The talented duo will be joined as co-hosts by fellow poetry and music-enthusiast Lucy Paterson, in this magnificent evening of entertainment, music and verse. Folly, Fantasy and Feeling will be performed for one night only at the Salesian Theatre, Sliema on February 27 from 6.30pm to 9pm. Patrons are entitled to free parking. Tickets are available from the Manoel Theatre website at http://booking.teatrumanoel.com.mt/Event/12384/ .